Do you suffer from seasonal allergies? Sick of buying allergy medication? 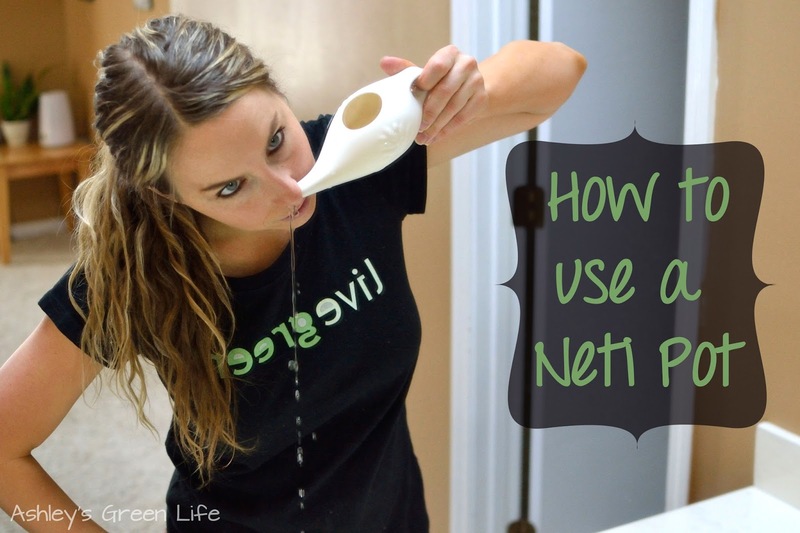 Give the Neti pot a try! I've been using a Neti pot for several years now and before I started using it I was on several prescription allergy medications. 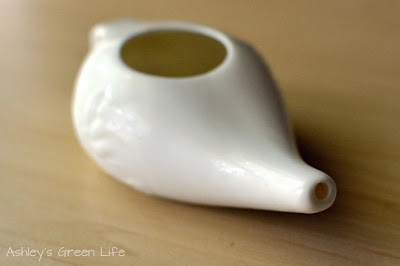 Fed up with the feeling of dependence on prescription medication, I went in search of some natural alternatives...one of those being a Neti pot. A tea pot? What did you say? I know it's strange right? Even stranger is what you do with it...pour water in one nostril and have it come out on the other side. Just lovely. But the concept is simple, by "washing out our nostrils" at least once a day, we are able to remove dust, allergens, and other environmental irritants that we may have "collected" throughout the day. With those "little nasties" gone you can breathe easier, not be hassled by sneezing and sniffling, and know that we've cleaned one of the most important parts of our bodies! Now if you can get over the crazy way it looks and in the beginning, how it may feel, it will be so worth it. Since doing the neti pot, I've been able to cut out all my use of prescription allergy medication (with the help of also going vegan and cutting out dairy). Now I don't look ahead at the allergy forecast in fear, hoping it's not a "high pollen" day. I know that my neti pot has me covered. On top of that, you kind of get hooked on the feeling. I mean, think about all the parts of our body that we wash daily, some even multiple times a day. But what about our nose? Doesn't it want to be clean too? 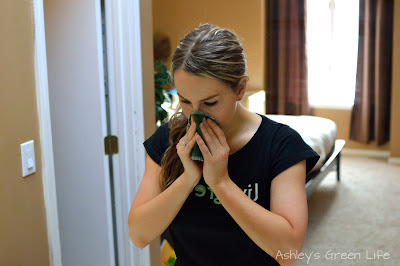 Well, enough with the "dirty noses" it's time to clean them out and really breathe in the fresh air...oh by the way, we'll reduce some of those allergy symptoms too. 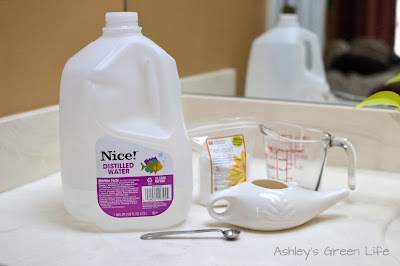 What you need to do the neti pot. What kind of neti pot should I buy? There are many types of neti pots on the market, some ceramic and some plastic. You can use what works for you. You can probably guess that since I'm a bit of a plastic-phobe that I went with the ceramic version and I love it. They run about $10-12 and can be found online like here, or at local drugstores or health food stores. What solution do you put in the neti pot? I use a Neti-Salt from the same company as my neti pot, which is a non-iodized salt. They recommend using 1/4 tsp. of the salt per 1 cup of water. I found this for $3 at my local health food store. dangerous amoebas being passed into my sinuses and possibly killing me...seriously? I thought it was pretty bogus and blew it off. 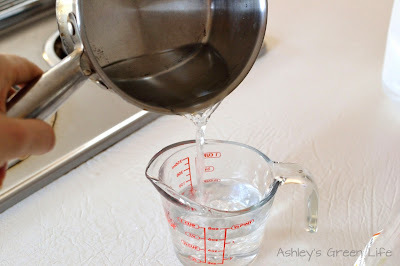 But, since doing this post about filtering your shower water, I learned more about the nasties that are in tap water. 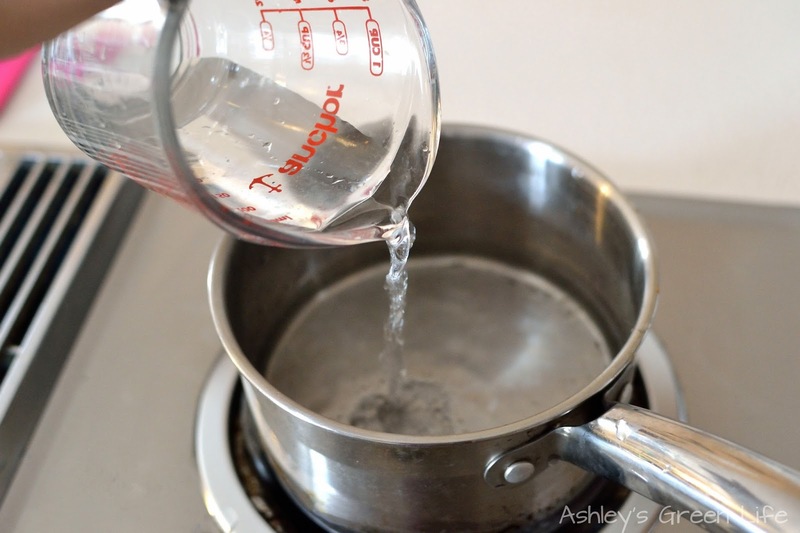 So to be safe, I started using distilled water, and I couldn't recommend it more. I got this gallon jug from Walgreens for under a dollar. And although it's a bit of a pain to buy, I appreciate the peace of mind I have with using it for my neti pot water. But if for some reason you have to use tap water, you'll want to boil it for several minutes to kill any possible bacteria or amoebas (among other things), and then let it cool to a temperature comfortable for rinsing your nose with. How warm is the neti pot water? For me I relate it to bath/shower water. So while you want it to be warm enough to be comfortable for you, you don't it to be too warm that it will burn you. The same works for a neti pot, if it's too cold it will feel like you got pool water up your nose, but if it's too hot it will burn when it goes through...also not fun. 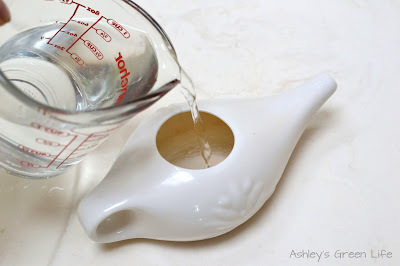 So play around the temperature until you find what's just right for you and try to re-create that temperature each time you do the neti pot. neti salt, distilled water, and a neti pot. the water quickly and it usually takes 1-2 minutes max. the salt and water easily. 4. 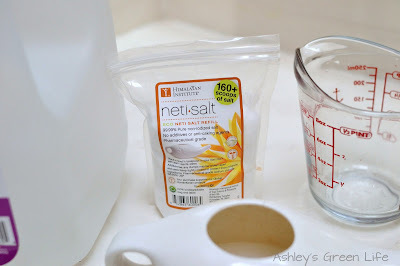 Then I add half of the water/salt mixture to the neti pot. 4. Now tip your head to one side and insert the neti pot spout into your nostril. to flow from one nostril to the other. 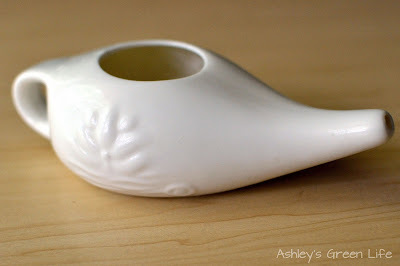 My catchphrase for using a neti pot is just to: "Let it flow!" You'll want to relax into the sensation, and just let the water flow from one nostril to the other. I like to visualize that it's picking up all kinds of dust and allergens along the way, leaving my nasal passages nice, clean, and clear. Also, be sure to keep your mouth open as you'll be breathing through your mouth as you do this. 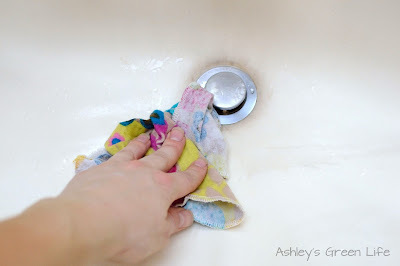 Once the water/salt mixture has ran out on this side, give your nose a good blow into the sink (or with the help of a cloth napkin) and then go onto the other side. into nostril, lift elbow, and let it flow. 6. Once your done rinsing, blow your nose another time or two. a few minutes afterwards, that's normal. Still have questions? Check out this interesting "Neti Pot Safety Guide" put out by the Himalayan Institute. 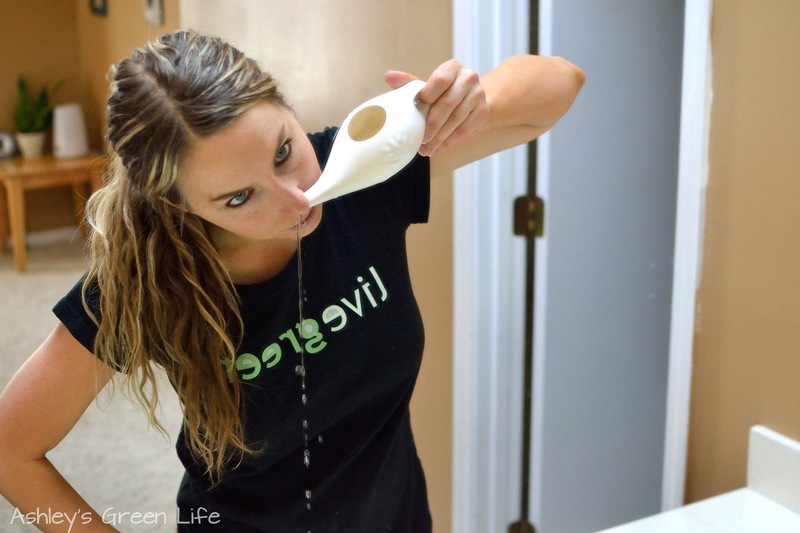 So that's how I go green with my allergy routine by using the neti pot. Have you ever used a neti pot before? Or do you have any questions about how I use mine? Share below! 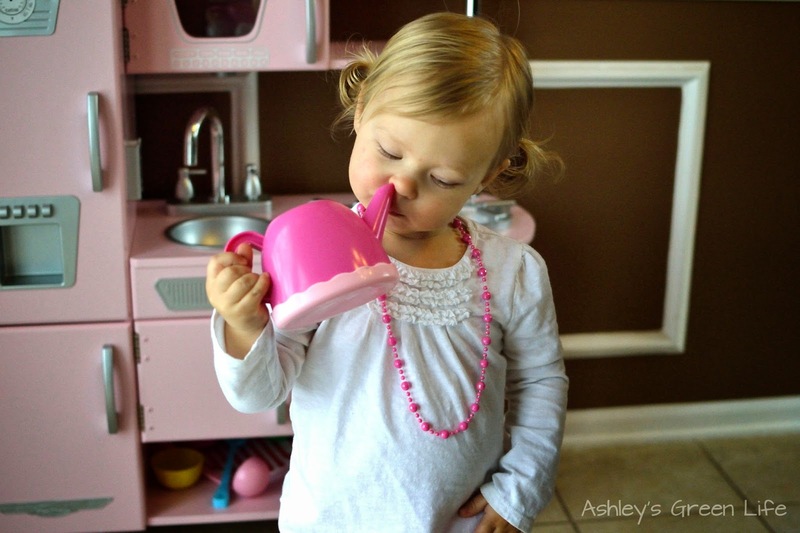 Avery at 22 months "practicing the neti pot". What can I say?